Chicken pizza crust recipe that is zero carbs needs only two main ingredients plus some seasonings of choice. It’s easier to make than the famous fat head pizza crust and easily customizable with your favorite toppings. 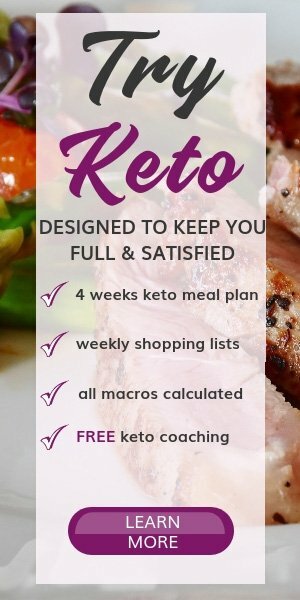 A 2 ingredients keto pizza crust – Can you believe that having pizza on a keto diet is possible? Yes, and it’s made with ground chicken. 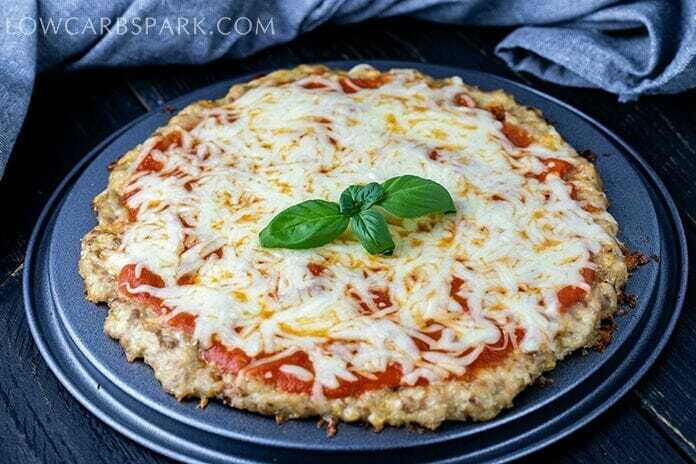 I’m sure you know all about the fathead pizza crust that’s a mixture of almond flour, mozzarella cheese, eggs, and seasonings, but today I’m going to share with you my latest keto pizza crust recipe. 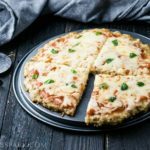 How to make chicken pizza crust? It will take you a few minutes to gather all the ingredients, shape the mixture into a pizza looking crust and bake until golden and beautiful looking. To make the process easier, start by preheating the oven. By the time you have to bake the crust, you won’t have to wait. In a large bowl combine the ground chicken, with the grated mozzarella cheese, salt, and the Italian seasonings. Use plain, unseasoned ground chicken and make sure to use low moisture mozzarella cheese. Spread the chicken mixture into a big round pizza shaped crust. Sometimes I like to shape it into 2-3 mini individual pizza, bake and then freeze them for further use. Bake the chicken pizza crust for about 20 minutes before adding any toppings. Don’t worry if the pizza crust starts juicing in the oven; it’s the moisture released by the chicken while baking. Try removing as much moisture as possible with some paper towels, then add your favorite toppings. Bake for another 10 minutes and the keto pizza is ready to be served. I love to keep things simple, so I only added low carb pizza sauce and some mozzarella cheese. But you can add any pizza toppings you like. Some vegetables such as mushrooms or peppers would be a perfect addition. How many carbs are in the chicken pizza crust? 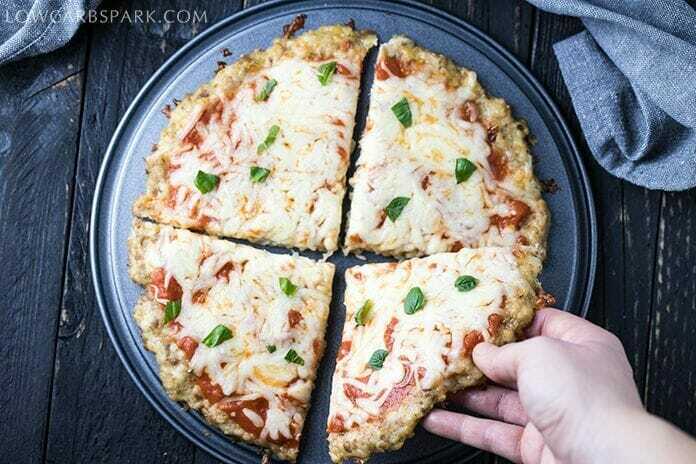 This keto pizza crust recipe uses ingredients that individually have zero carbs. There are probably the only traces of carbs from the seasonings and the mozzarella cheese. Anyways a serving of the chicken pizza crust has less than 1g of carbs. Can I freeze this chicken pizza crust? Yes, this recipe is perfectly freezer friendly. All you have to do is to pre-bake the chicken crust before freezing. 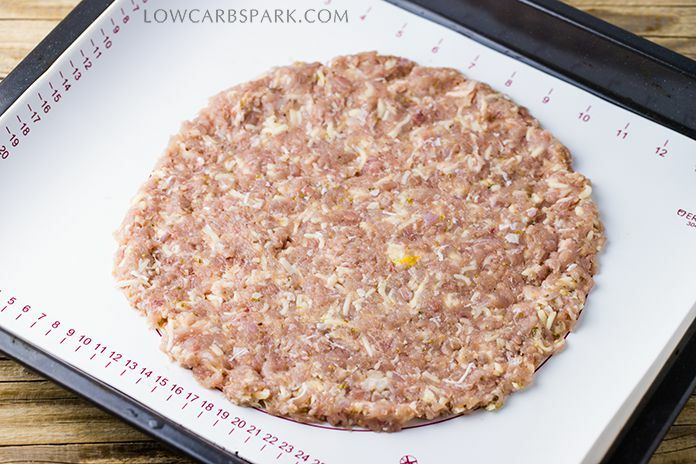 Let the keto pizza crust completely cool down then wrap it in plastic wraps and freeze for up to 2 months. When it’s time to make pizza again, reheat the crust in the oven at 400F on a parchment paper. Add the toppings and bake until the cheese melts and the toppings look done. 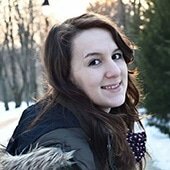 Can I use canned chicken for the pizza crust? 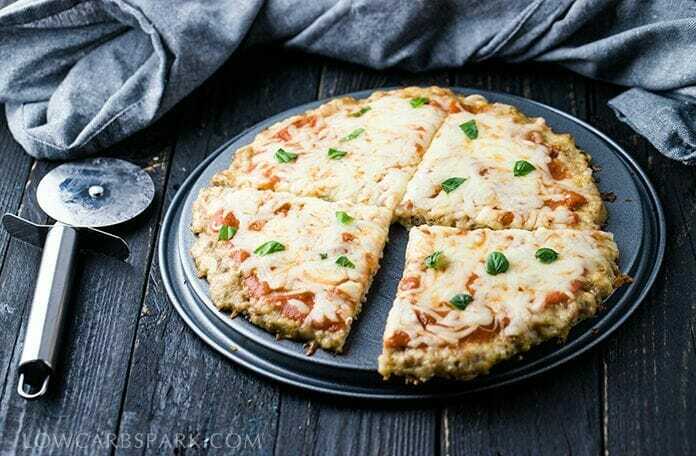 Yes, you can use canned chicken to make this keto pizza crust. Drain all the liquids well and mix it with the cheese and seasonings. Bake the canned chicken pizza crust and then add any toppings you desire. You may want to add an egg to bind all the ingredients together. 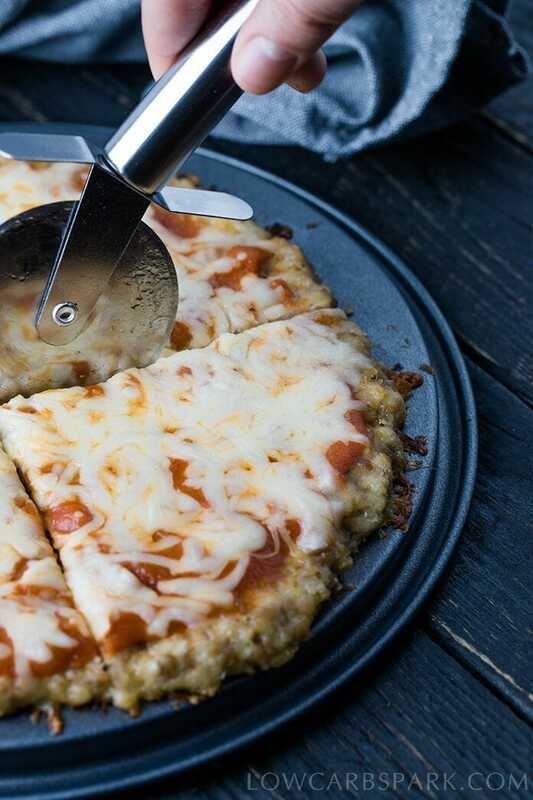 Try a delicious keto chicken pizza crust ready in 20 minutes. 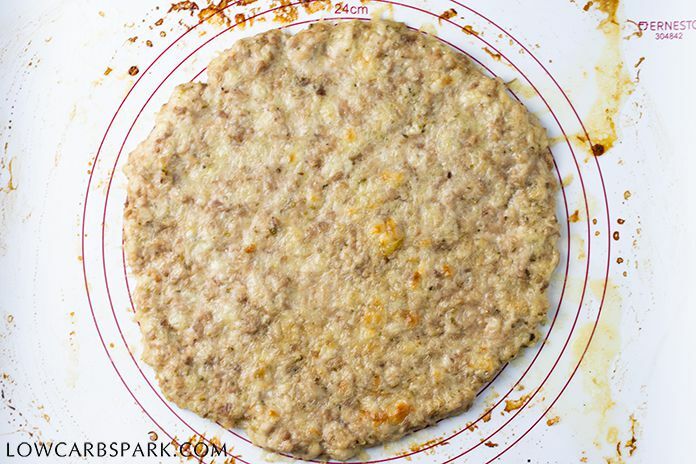 Learn how to make an almost zero carbs pizza crust using only 2 ingredients: ground chicken and cheese. Season to taste and add the best low carb pizza toppings. Add your favorite toppings and bring the keto pizza bake to the oven for about 10 more minutes. Enjoy half of the pizza. You can freeze the rest of the pizza and reheat when needed. The macros are calculated only for the chicken pizza crust excluding any the toppings.